Landward Research Ltd recently completed a report on the State of the Archaeological Market in the UK. There is both good news and bad news for the state of professional archaeology. Job losses have stabilized since the the recession but they are still down 800 positions (5,900) from pre-crash levels (6,700), though these numbers do not take into account the potential growth in jobs had the recession not occurred. Looking at the Profiling the Profession reports (provided at the Landward Website) between 2002-03 and 2007-08, employment increased by 20 percent. Had that trend continued, there would currently be around 8000 archaeology jobs in the UK. This puts the actual losses at closer to 2,000 jobs. This larger number probably explains the tough competition among recent graduates and veterans for jobs, there are five years of students who have not been able to obtain jobs except from positions created by the retirement of archaeologists. Heritage tourism is on the increase, states a Native American Times article (3 April 2012) by Susan Montoya Bryan. Based on a report commissioned by the Navajo Nation from Northern Arizona University, data show that some 600,000 visitors made nearly $113 million in direct purchases on the reservation in 2011. That represents a 32 percent increase in tourism spending since 2002. Surprisingly, this increase occured over the same period when U.S. gasoline prices rose from approximately $1.80 to $3.90 a gallon. 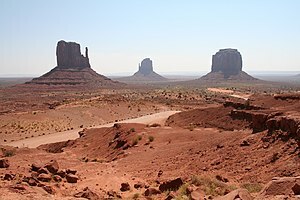 The Navajo Nation, a soverign nation since 1868, is the largest Native American reservation in the United States. It covers 27,000 square miles in Arizona, New Mexico, and Utah. Traveling to the Nation by automobile, and there are few other options for visitors, is a significant trip from almost anywhere. However, the article states that U.S. visitors to the Nation were actually down in the period since 2002. It was non-U.S. visitors, primarily from Germany and France, that were up more than 11 percent and responsible for the increase. Its list time in Canada, when many of the provincial lists of qualified archaeological firms get updated. Recent articles in Heritage Business Journal have noted a shift in market share away from heritage-only firms. In the draft of the current list of qualified Alberta archaeological consultants there are 27 companies listed: 19 of these were heritage-only firms and 8 were multidisciplinary firms. This listing also suggests that multidisciplinary firms have more staff (average of 2.8 vs. 1.8 for the heritage-only firms). There are three caveats here. First, I sorted the firms on my knowledge of what they do–they are not listed that way. Second, while more heritage-only firms have a single archaeologist, the number of staff on the list is not very consistent. Third, it should be noted that not all the firms on the list are actually in Alberta, in case readers are wondering how a single province supports 27 archaeology firms. The recently announced Chancellor’s Budget in the UK includes a proposal to increase the VAT from 0 to 20 percent for the alteration and maintenance of listed buildings. This will put a heavy financial burden on those that own or maintain historic listed buildings. Full details can be found at the HM Revenue & Customs website and consultation on the proposed changes has been put up by the CBA (p. 23), which is open until 4 May 2012. Heritage Business Journal seeks correspondents and industry analysts. See the Correspondents page for details. Anthropology & archaeology the worst college degrees in the U.S.? Is Western Australia’s heritage compliance boom suddenly over?